It has now been 12 days since the Varsity onions have been planted. I’m quite surprised – because there are currently only 22 onions that have come up as of today. It seems that between three and four have been sprouting over the past five to six days. It will be very hard to do a good comparison against the Varsity onions and the Copra onions with only 22 Varsity onions versus the 140+ Copra onions. The Copra onions are still coming along well with most putting on their second set of “leaves”. I haven’t trimmed these back at all. Last year I kept trimming them back to between two and three inches tall. 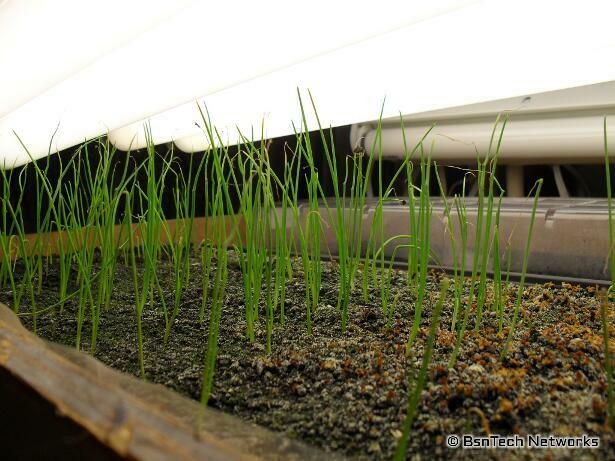 And lastly for onions, these onions are a little over two months old now – well, since they were started anyways. They were started back around December 18th and they are still growing strong. They are unfortunately root-bound though, but I hope by feeding them compost tea for another month and a half, they’ll survive in their small containers. 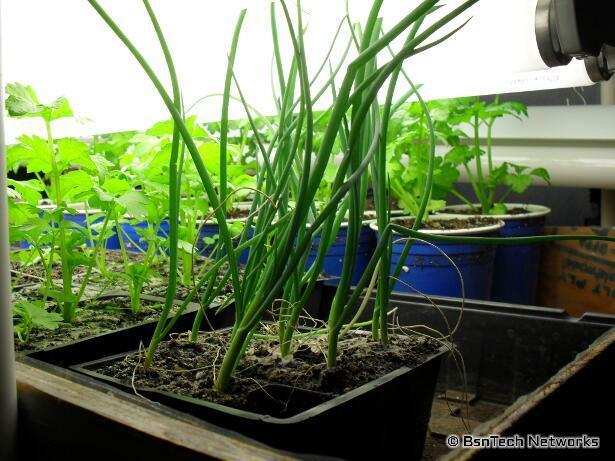 Look at those plants behind the onions! Those are the Ventura celery plants. You can see in the back that I have transplanted some of the celery from the black three-packs (seen on the very left where other celery is) to the blue 16-ounce cups. The celery that was transplanted was also planted back around December 18th – so they are two months old as well. The roots were coming out of the bottom of the three-packs – so they had to be transplanted. Hopefully they will survive well in the 16-ounce cups for another month and a half before they are transplanted to the garden. And a look at the other celery plants. These are between two weeks and six weeks old. With all of the time, effort, and growing space for these Ventura celery plants, I certainly hope they pay off this year! I only have growing space for about 18 of these plants if I plant them one foot apart. But I’m thinking I’ll try to squeeze them to maybe 10 inches apart – which will allow me to plant an additional four celery plants. Currently I have 12 two-month old celery seedlings, approximately 10 month-old celery seedlings, and 10 two-week old celery seedlings. So that is 32 – and I may only get to plant 22. I planned for a good buffer in case I had trouble growing celery this year – but alas, I was very successful with high germination rates! 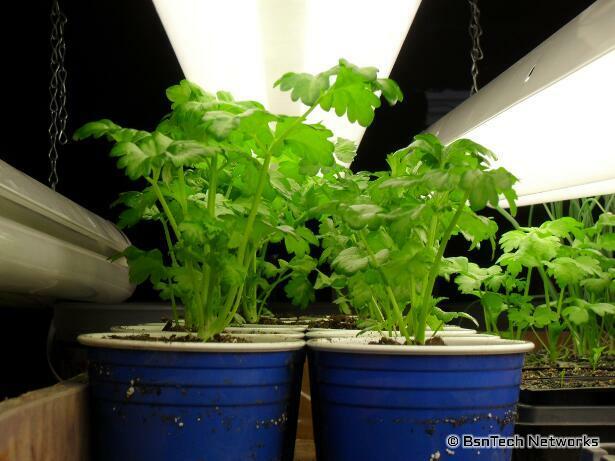 The key to growing celery from seed is that celery seed MUST have light. I soaked the seeds overnight in water and also soaked the growing medium from underneath – so it was fully saturated. Then I placed the celery seeds right on top of the soil and just barely pressed them in to the soil to make good seed-to-soil contact. But they were still lying right on top for the light to penetrate. Last year I had very low celery germination (about 44%). This year the germination rates have been at a remarkable 89%. From previous posts, I’m not sure if I’ve shown my “germination station” and what it looks like. 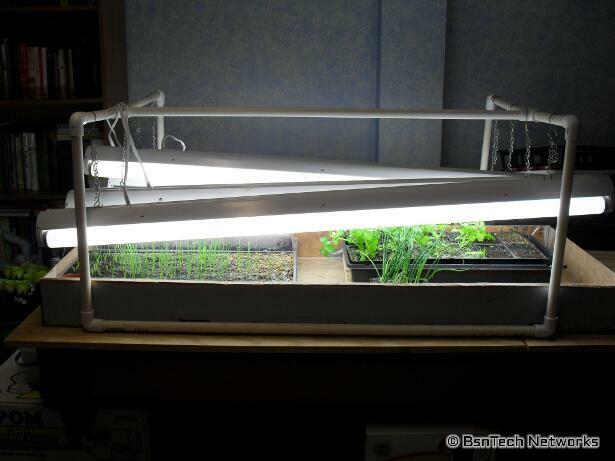 The basics of my plant lighting system is very basic and fairly inexpensive. 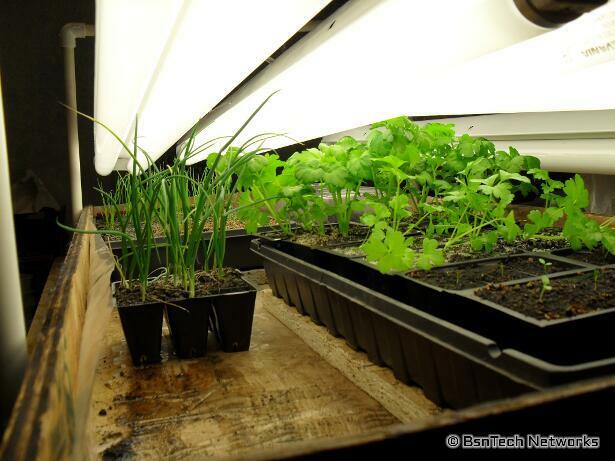 The seedling lighting system currently has four 4-foot fluorescent fixtures that have two bulbs each (8 40-watt bulbs total). I use cheap cool white bulbs and they seem to do just fine. No need to get those expensive grow bulbs – and I actually have better results with cool white than I did the grow bulbs. I then constructed the hanging system from cheap 1/2-inch PVC pipe. Based on my other blog posts about my PVC irrigation system, you can tell that I really like using PVC pipe.. For this system, I needed about 20 feet of pipe (less than $2). I then needed eight 90-degree elbows (another $1.60 or so) and two “T” connectors (less than $1). So the support structure was less than $5 to construct with PVC pipe for the plant lighting system. The four-foot fluorescent fixtures cost about $9 each – so this is where the money gets involved. I was also using premium cool white bulbs in three of the four fixtures. Two of these bulbs were costing me almost $7. But when I just recently set up the fourth fixture, I purchased the cheaper utility cool white bulbs and they were $3.50 for a set of two. The difference between them was very minimal; the watts were the same but I believe the light output is just a bit less. 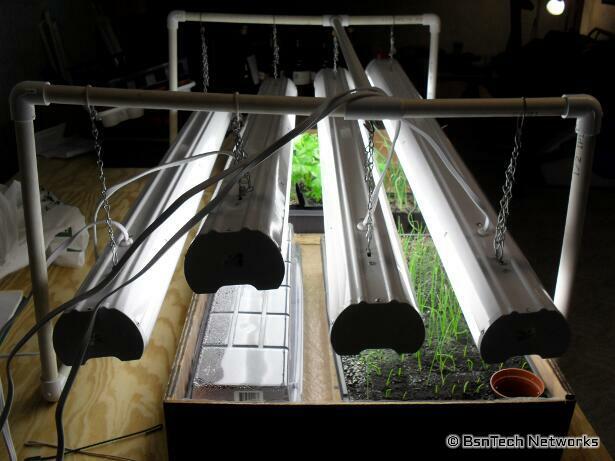 Luckily we use these four-foot fluorescent fixtures in the basement for lighting above our suspended ceiling, so when it comes to growing time, I just pull out the fixtures from the ceiling, add the better bulbs, and I’ve got a system. Unfortunately I don’t think I’ll have enough room – even after adding a fourth fixture to the system this year. I’ll be growing almost four times the amount of broccoli and other larger plants that need space to grow. I always put them in 16-ounce cups ($1.99 for 40 of them). Based on four feet of light and cups with a diameter of 3.5 inches, I’ll only be able to fit 13 of these cups under one light. Ouch – that barely covers the number of cauliflower I’ll be growing. Not to mention the 25 broccoli, 10 peppers, and 5 tomatoes. The current plants are still growing very well – too well actually. We’ve had a bit of a warm-up recently and I actually took the plants outside this past Sunday for a few hours to sit in the sun. It was about 60 degrees in the sun (under the lights it ranges from 59 degrees at night when they are off – to about 70 degrees when they are on). When taking them outside, I looked under the plants that have been growing since mid-December. Those were done only to test seed viability – but I opted to keep them to see if they would make it to planting outside. Anyways, the onions and celery that were planted two months ago – are now root-bound. 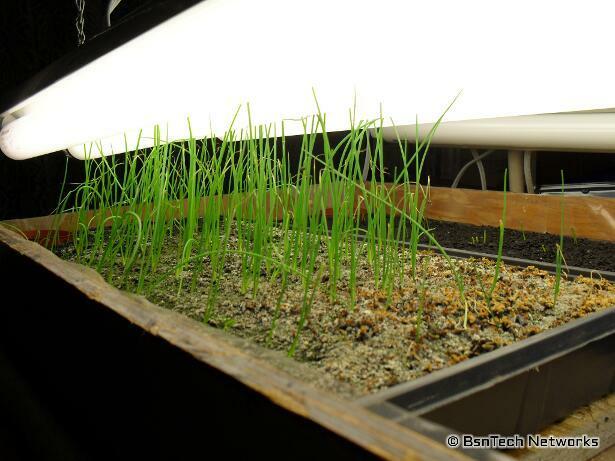 I planted two onions in each cell of nine-packs – so I expected those would get root-bound. The celery are planted in three-packs (already transplanted from six-packs) – and the roots are beginning to come out of the bottom. So, it looks like I’ll have to get the 16-ounce cups out and transplant again! 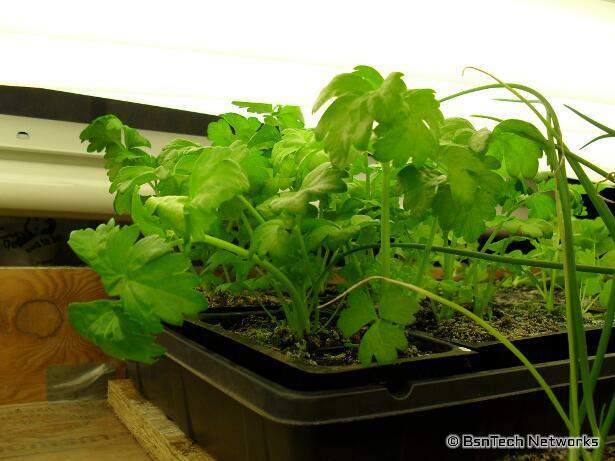 Here are what the 8-week old Ventura celery plants look like. They are doing very well – even better than what they were last year in eight weeks. I attribute this to using compost tea mix that I had left over from last season to water them. On the left in this picture shows the eight-week old Copra onions. On the right is all of the celery plants. 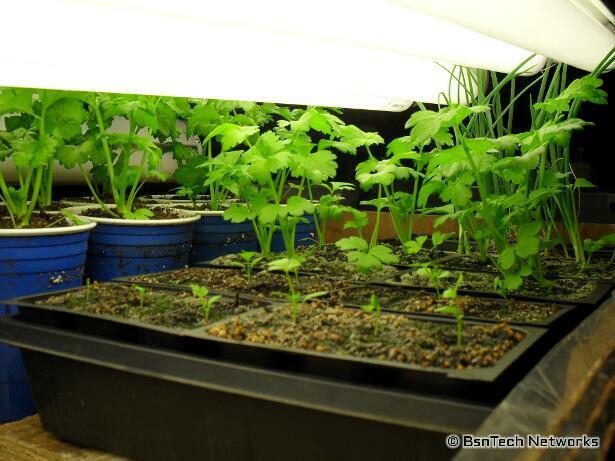 In the front are seedlings that are 15 days old followed by month old, then two-month old. 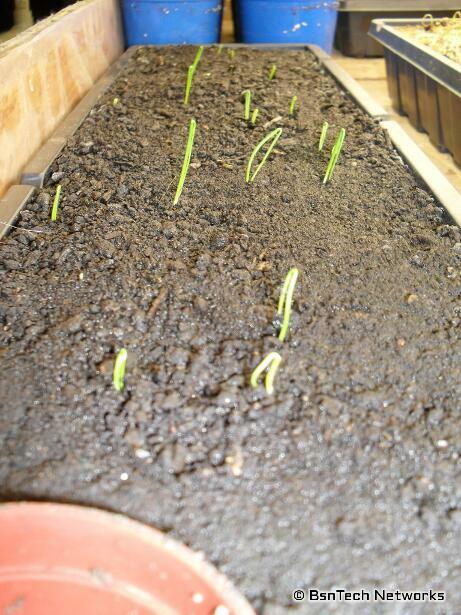 And here are the onions that were planted on January 20. I planted all of these onions in one tray. The tray is about 10.5 inches wide and 21 inches long. I stuffed 200 seeds in here to start with. Of those, about 130 came up (since the onion seed is a year old). I then added another sowing of 36 seeds (finished the packet off from last year) and about 26 of those have come up. Out of the 156 that have germinated, about 149 are still surviving. Behind these is the covered container of 136 Varsity Onion seeds that were planted. It has been five days since those were seeded and none have germinated as of yet (also year-old seed). Hopefully things will be ready for planting out. I started onions and celery – in some cases – almost a month earlier than I did last year – because when they were planted in the garden, they just were not ready for planting. I may have planted them too early this year; only time will tell. Last year we had a fast heat wave that hit the area – so they were able to get planted out in mid-April. This year – depending on the weather – they may be planted out after that or before that. 2011 Garden Plans & More Snow! Finally after a half-dozen revisions, the 2011 garden plans have mostly been finalized. I’m sure there will be a few more changes to this when the plants begin to go into the garden. 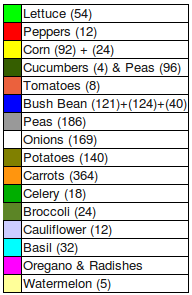 First, here is the coloring system and the numbers of each vegetable I’ve used below for the plans. And for the full layout of the garden. 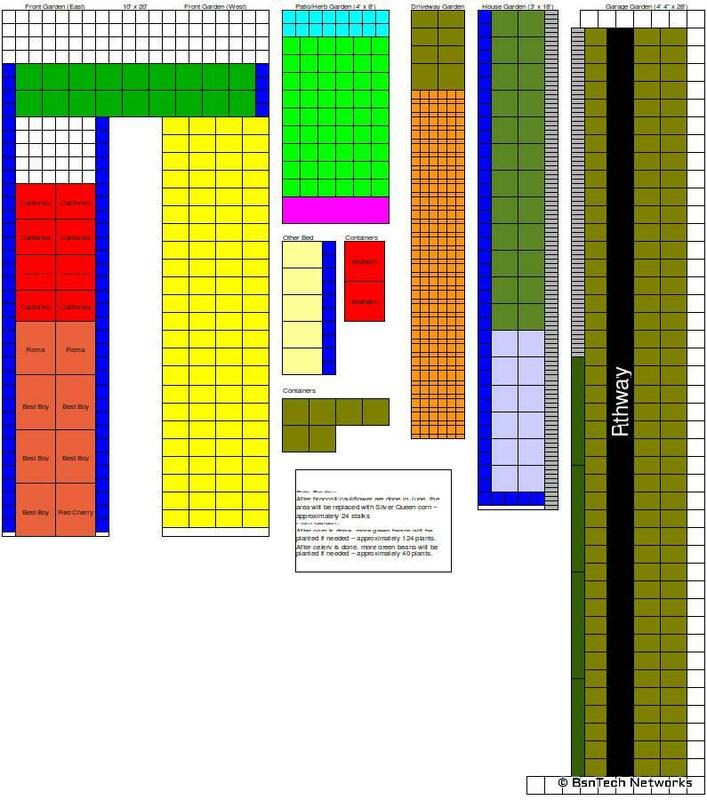 This is pretty hard to read but more than anything, it gives the general layout of where items will be placed. You can click here to see the full view; it is about 25% larger than what is displayed here. This year is the year of attempting to stuff more plants in the same amount of space as last year. There won’t be any additional space used for the garden as I’ve fully used everything I have – unless I dig out more sod in the front yard – which simply won’t happen. Last year, I planted corn 12 inches apart in rows 18 inches apart. This year, the corn will be planted 8 inches apart in rows 12 inches apart. This is because I only have one area of the front garden I can use for corn – since the other side will have onions, peppers, and tomatoes. Potatoes will also be squeezed to eight inches between plants instead of 12 inches. When I was digging up the potatoes, there still seemed to be considerable space between the potatoes in the ground. By making them closer, I hope they will produce just as good – except there will be more plants! The broccoli will also be squeezed into an 12″ x 12″ area. We’ll see how successful this is. The broccoli have all been planted 18 inches apart in rows & between plants. This isn’t a 50% reduction, but it is considerable. This year will also see the re-introduction of cauliflower. I skipped cauliflower last year because of the bad results with it. So, I’m going to try it again with the same 12″ x 12″ spacing. What else will be planted closer? Peas. I’ve planted peas all four inches apart for the past two years. This year they will occupy 50% less space; they will be planted two inches apart. Onions will also be changed from eight inch spacing to six inch spacing between plants and rows. This is primarily because I expect a much larger number of onions planted this year. Someone on the GardenWeb forums offered to send me some Varsity Onion seed they didn’t need – so I’ll be planting these along with Copra this year. What will be new for the 2011 year? Watermelon. I had a small gardening area where I’ve planted potatoes before, but the ground is simply too hard for potatoes and all of them rotted last year. So, hopefully watermelon will grow in this area. What won’t be back for the 2011 year? Parsley and cilantro. Last year I planted 32 of each (16 kept after thnning). We used absolutely zero parsley and the cilantro we received wasn’t worth the effort. The cilantro was grown only for our salsa – and there wasn’t enough to make a taste difference. This area will now be used by more plantings and more varieties of lettuce. So I’m certainly hoping that this year will not be a flop. With spacing things closer together, this will allow for higher yields (hopefully) – but will require additional fertilizer. I plan to use the pelletized 12-12-12 fertilizer more this year. In addition, I’m hoping to have my compost tea system fully completed where the tea will be dilluted with water in the rain barrel PVC irrigation system. I have a total of 12 rain barrels all hooked in series now – and three of those will be filled with compost tea. So it will be 3 parts water to 1 part compost tea. I am going to attempt some crop rotation this year as well. While it is unreadable in the full-sized copy of the graphic above, the rotation will be very limited. Last year, I planted cucumbers where the peas were in the garage garden. This year it will be the same – although I’ll reduce the cucumber plants from six last year – to only four this year. The peas and cucumbers work well together and I just have to be careful when removing the pea vines that I don’t pull out the cucumber vines. When the broccoli and cauliflower are finished producing mid-June, I plan to backfill this area with 24 Silver Queen corn plants (hence the 24 number in the legend above under corn). I have an unopened 2 ounce packet of Silver Queen seed from last year – so I’ll use 24 of them here. Silver Queen is a long-season corn – so I hope it can complete before the fall frosts. When the corn in the front garden is finished (which is Honey Treat corn – matures in approximately 76 days), this area will be filled with Bush Blue Lake 274 green beans. Beans can be planted six inches apart – and the front garden is four feet wide. I certainly am not going to make eight rows of green beans in this area – but will plant four rows. That still is about 124 additional green beans (hence the 124 number in the legend under Bush Beans). If needed, additional Bush Blue Lake 274 green beans will be planted where the Ventura celery is in the front garden. I’ll make two rows in this area – two rows of 20 plants each (40 total – hence the 40 number in the legend under Bush Beans). These are the varieties of vegetables that I plan to plant this year. Some of them are already started – and I just hope they were not planted too soon! Wow – that is quite the list now that it is put down! Amazing how many different varieties/vegetables will be planted. 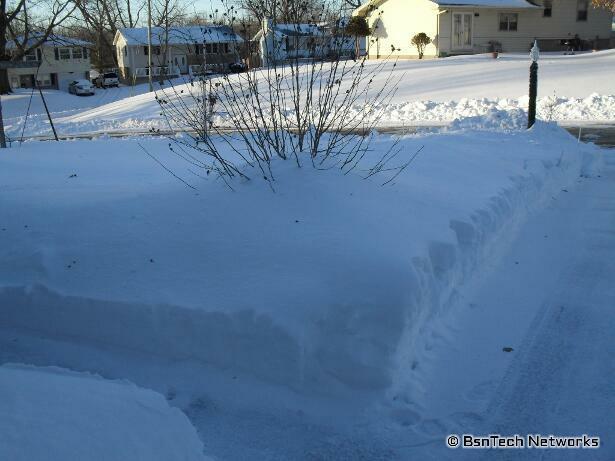 Bring Your Shovel – and Remove Some Snow! So we have seen quite the blizzard this week in Central Illinois. 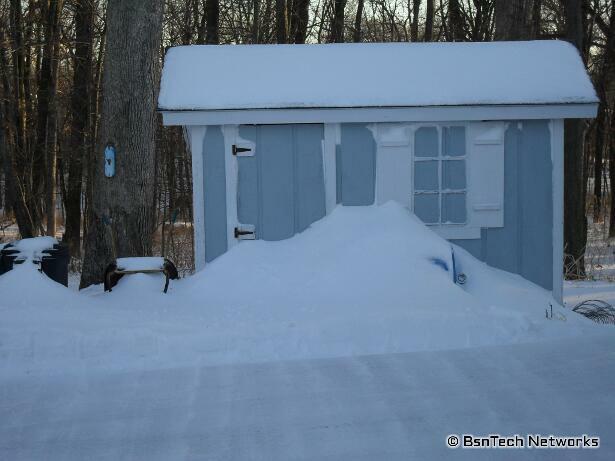 First, we got about four inches of ice pellets – followed by another four inches of snow. 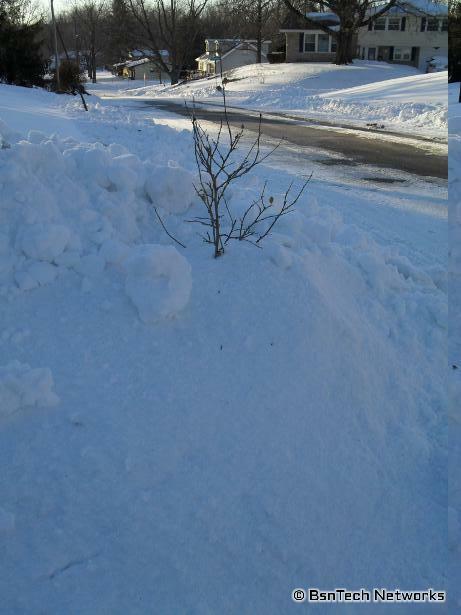 This made shoveling and clearing this exceptionally difficult because how hard the snow pack was. Then, we just got another two-three inches of snow yesterday (Saturday) that had to be cleared. There is a couple more chances of snow in the forecast for the next week as well. I don’t know where all of this snow can be put. The front gardening area is fully under snow. This poor little Rose of Sharon tree down on the corner is almost covered up! Good thing I don’t need to get into the shed for a little while! 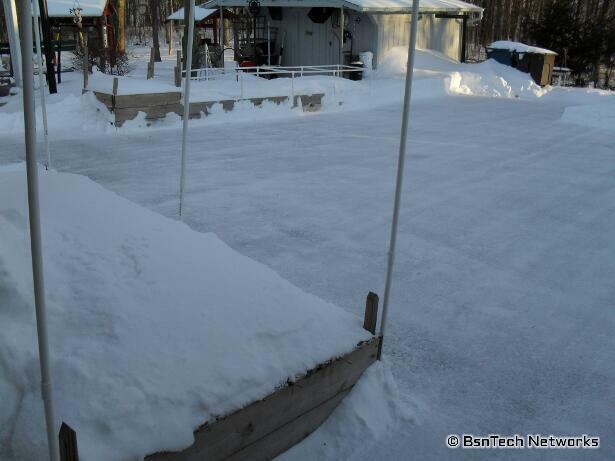 The driveway is still ice-covered but I did my best of clearing it out. Temperatures today are at 34 degrees currently so I’m hoping some of this gets melted before our next snow fall. I spent quite a bit of time researching this issue. It seems that ever since I upgraded my MythTV Ubuntu Media Center box to Ubuntu 10.04 Lucid, the Hauppauge HVR-1600 remote control would no longer work. Luckily I had an old analog Hauppauge PVR-250 and I kept this PCI card in the computer – just to act as the remote control receiver. I finally found a solution to get the Hauppauge HVR-1600 remote control to work with Ubuntu 10.04 Lucid. I used a number of sources that allowed me to get this working – but I’m compiling the exact information on how to do it right here – so only one source is needed. First, I’m assuming that you already have lirc downloaded – the lirc daemon that receives the key presses from your remote. Next, you need to download and install the lirc-modules-source package. Now that you have downloaded the lirc-modules-source and installed it, you need to download the firmware – haup-ir-blaster.bin for the remote to work. Download the firmware here. Once the firmware file is downloaded, you need to move it to the /lib/firmware directory. Now that is done, you need to download this zilog.diff file and save it. OK – here are a few commands you need to do. This will patch the lirc-modules-source install with the zilog.diff file you just downloaded. Your path below may be different – but it still should be in the /usr/src directory. The above indicates that the zilog.diff file is in your home directory (hence the ~/ notation). If not, you need to change this to where you downloaded and saved the zilog.diff. Now, restart lirc – and hopefully if you’ve done everything correctly above, your remote should start working.